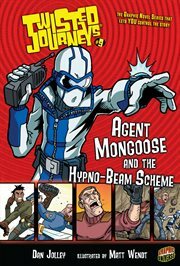 The item Agent Mongoose and the hypno-beam scheme, Dan Jolley ; illustrated by Matt Wendt, (electronic resource) represents a specific, individual, material embodiment of a distinct intellectual or artistic creation found in Austin Public Library. Your top-secret mission: defeat an evil mastermind. But you'll have to find him first, and spies are all around you! Which twists and turns will your journey take? Your top-secret mission: defeat an evil mastermind. But you'll have to find him first, and spies are all around you!